In this newly expanded second edition of "12 Essential Skills for Great Preaching, "Dr. Wayne McDill draws on decades of experience as a preacher and homiletics professor to inspire other preachers to live up to their God-given potential. ^Here are twelve proven ways to pack more content and effectiveness into every sermon, covering all of the bases from general preparation to the end result of increasing each listener's faith. Recent seminary graduates and seasoned pastors alike will identify skills that need personal improvement, and McDill encourages them to strengthen such areas at their own pace and in whatever order they feel is best. ^Every chapter in this new edition has been revised and updated. Also included are additional worksheet helps and sermon examples. 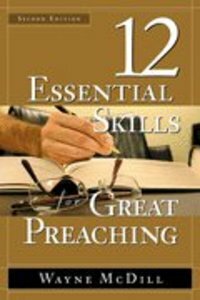 About "12 Essential Skills For Great Preaching (2nd Edition)"